Most people don’t expect to face intense mountain ranges in Ethiopia. But it’s there, and it’s remarkably beautiful. The Simien Mountains are located in the northern tip of Ethiopia and make up part of the Simien Mountains National Park that stretches for 85 square miles. Not only do hikers come here to get their fix of nature and put their climbing skills to the test (some of the peaks are as high as 4,500 meters), they also come here for the wildlife viewing. Get ready for an incredible wildlife adventure high up in the peaks, here are some of the animals you’ll find in Ethiopia’s Simien Mountains. Many people mistake them for baboons but these monkeys are strictly endemic to the Ethiopian Highlands and predominately found traipsing across the flattops of the Simien Mountains. Their alternative name is the “bleeding-heart monkey” for obvious reasons, and they’re the only known monkeys in the world to solely depend on grass for food consumption (which is odd for primates). Approximately 2,500 geladas live in the park, meaning you’re guaranteed to come across one on your hike. In fact, the geladas stick together and its common to spot them in herds of about 500-1,000. These endangered species can only be found in the area. Currently its believed that there are only about 500 Walia Ibex left in the wild, so when you spot them during your trip, count your lucky stars. Their declining population is due to deforestation and over-hunting. The ibex have learned to coexist with the gelada monkeys since they both share the same mutual predator. When grazing for grass alongside the geladas, both species keep their eyes out for unwanted visitors. The staff at Simien National Park are currently making efforts to protect them by creating new space for them to prevent inbreeding and keep them away from road accidents. 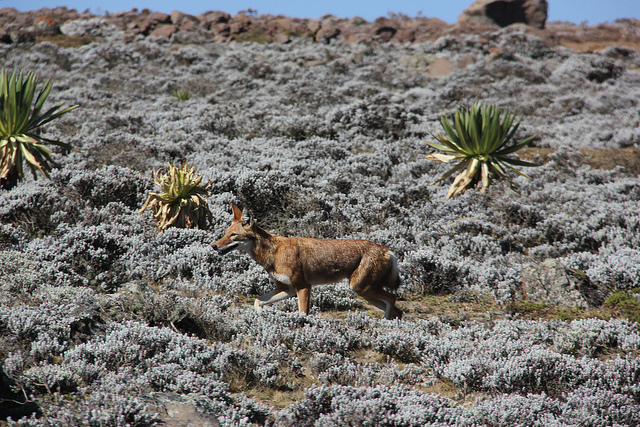 Although not endemic to the park, both geladas and walia ibex live in terror of the Ethiopian wolves. The wolves will spend their days observing the landscape before making their attack to nab a monkey or an ibex. They’re actually the only wolf species found in Africa, but sadly, they’re facing a decline in their population due to hunting, diseases and deforestation. 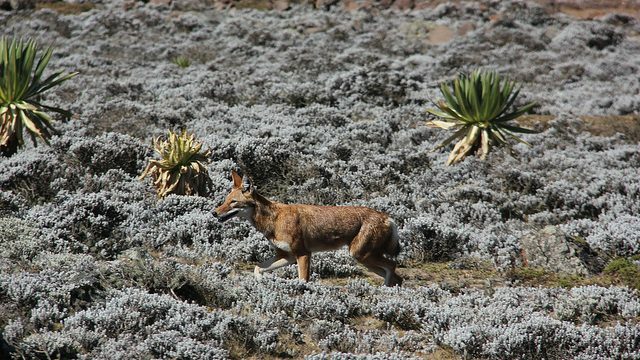 Because of this, Ethiopian wolves are the rarest canid in the world. They do not do well in captivity either, so preserving the wolves in the wild is crucial to their survival. There are about only 500 wolves left in the world. The Walia Ibex aren’t the only horned animals roaming the mountains, keep your eyes out for Menelik’s bushbuck, too. These antelopes are often found foraging through the wilderness and have the incredible ability to go on for long periods without drinking water. The bushbucks are harder to find since they spend their time in the shade and hiding in the bush to avoid the heat. When they feel threatened, they make a startling alarm call that sounds like a series of loud grunts to ward off predators and humans. Because of their upsetting reaction, they aren’t as hunted as other antelopes. While Simien National Park has plenty of birds and is a paradise for avid bird watchers, you’ll be astonished by this one particular breed. The bearded vulture is striking looking with an enormous wing span of two meters. They earned the nickname as “Bone Crushers” since they developed a technique to break bones into pieces by dropping them mid-air before swooping down to land to devour the bone shards. Up to 70-90% of their diet consists mostly of animal bones rather than flesh. They’re not endemic to the area, but experts consider this one of the best places to spot the birds since they are known to be seen along the cliffs.